With your vital donation you will become their guardian! Great responsibility lies with us, The Salt River Wild Horse Management Group, as we manage the Salt River wild horses under State Law ARS 3-1491 under the Arizona Department of Agriculture. It is our job to prove what we have always said: “this herd can be managed for the public and by the public!”. We invite you to be part of this important mission, with that, you will become an important guardian of the herd. Our humane management programs are multifaceted; from improving their habitat, to fencing, to emergency rescues, to public education, to our important fertility control program. This program will humanely reduce population growth in the Salt River wild horse herd, which ensures that every horse born in the wild can stay in the wild. These monumental feats are not without monumental costs. Although we are the designated management group working under contract with the State of Arizona, we do not get paid or receive any government grants. We count 100% on YOU, the public, to continue our important work. Please, will you consider a vital donation to ensure their future? Because we are an all volunteer group, every dollar of your donation will go towards the horses directly. Its very easy and quick, please click the donate button and set your amount, every dollar counts! You can also donate in someones honor and give that to them as a gift! They will get a beautiful thank you card. 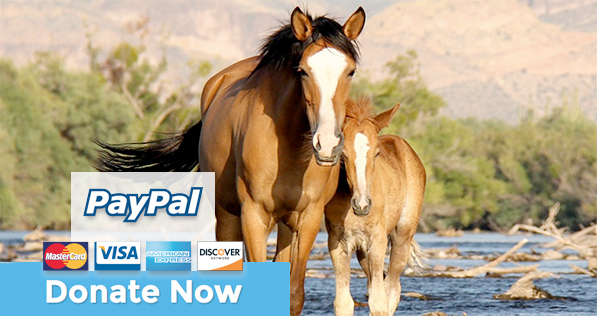 If you like paypal, our address is: SaltRiverHerd@Respect4Horses.com, and for checks our mailing address is: SRWHMG, 4610 N. 68th street #477, Scottsdale, AZ 85251. Your donation is tax deductable. There exists no greater reward, than knowing you made a difference.